I am beyond honored to be a part of Formation, the Guild of Book Workers triennial members’ exhibition, which has begun a two year national tour. Simply defined by Merriam Webster as “an act of giving form or shape to something,” formation can insinuate process, history, creation, change, beginnings, an arrangement, botany and landscape, personal narratives and impersonal storytelling. What makes us into the artists we are? How does our creative process influence the final product? What pushes us to continue to create? People, events, memories all combine to influence the art we make about the world around us, even if our work isn’t explicitly autobiographical. The Guild of Book Workers’ 2018-2019 exhibition encouraged members to consider how the act of formation spoke to their artistic process. An accompanying printed exhibition catalog, published this year as a special edition of the Guild of Book Workers’ Journal, will be available for sale at the venues and online at guildofbookworkers.org. The catalog features full color photographs and complete descriptions of each work; biographies of the artists; remarks from jurors Coleen Curry, Graham Patten, and Sarah Smith; and essays by Formation curator Jackie Scott and Guild of Book Workers President Bexx Caswell. The Formation Exhibition honors the legacy of the book workers’ craft and celebrates some of the finest examples of book arts today. Founded in 1906, the Guild of Book Workers has over 900 members today and is the only national organization dedicated to all of the book arts, including bookbinding, conservation, printing, papermaking, calligraphy, marbling, and artists’ books. 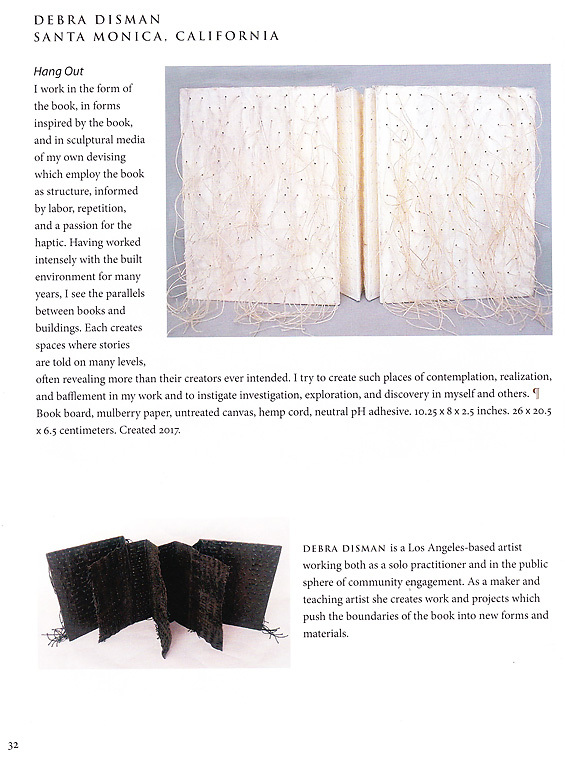 At a time when the masses are considering the materiality of the book and its presence or absence as a physical object, it is exciting to showcase the many hand crafts of the book form. The work presented in the Formation Exhibition is a vibrant and dynamic collection of Artists’ Books, Fine Bindings, Fine Press Printing, Calligraphy, and Sculptural Book Works that showcase both the history of the Book Worker’s craft, as well as contemporary interpretations of the book form. 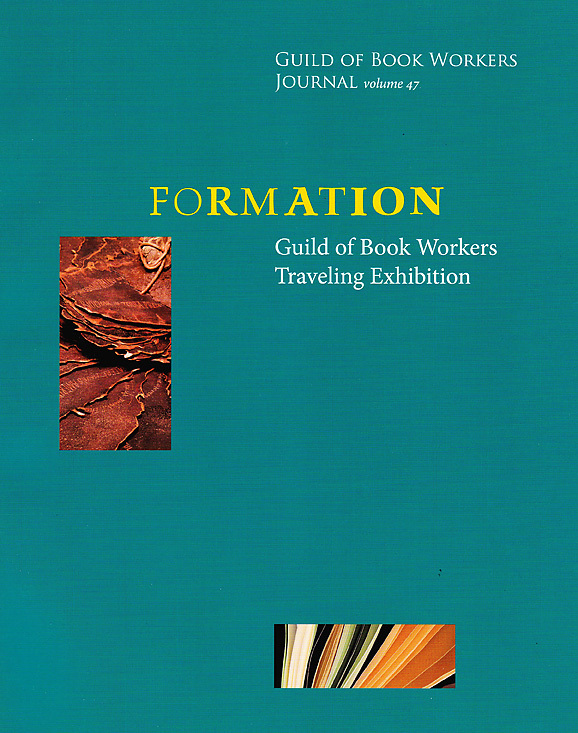 The Guild of Book Workers promotes interest in and awareness of the tradition of the book and paper arts by maintaining high standards of workmanship, hosting educational opportunities, and sponsoring exhibits. The Formation Exhibition features 51 works from 46 members that will travel across the U.S. from June 2018 through October 2019. 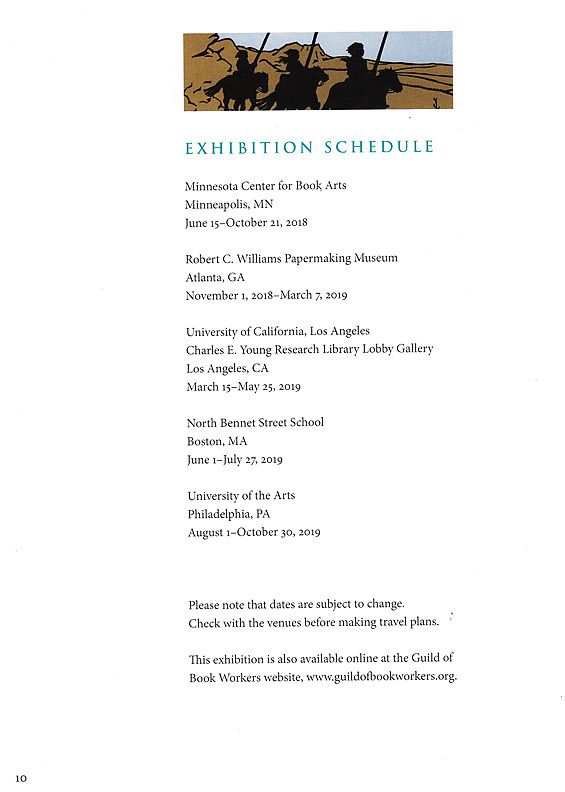 The show opens at the Minnesota Center for Book Arts in Minneapolis, Minnesota. It will be held at MCBA until the Guild of Book Workers’ annual Standards of Excellence Seminar in October 2018. Formation will tour the country, stopping at the Robert C. Williams Papermaking Museum in Atlanta, GA, UCLA’s Charles E. Young Research Library, the North Bennet Street School in Boston, MA, and the University of the Arts in Philadelphia, PA. A complete tour schedule is online at guildofbookworkers.org. 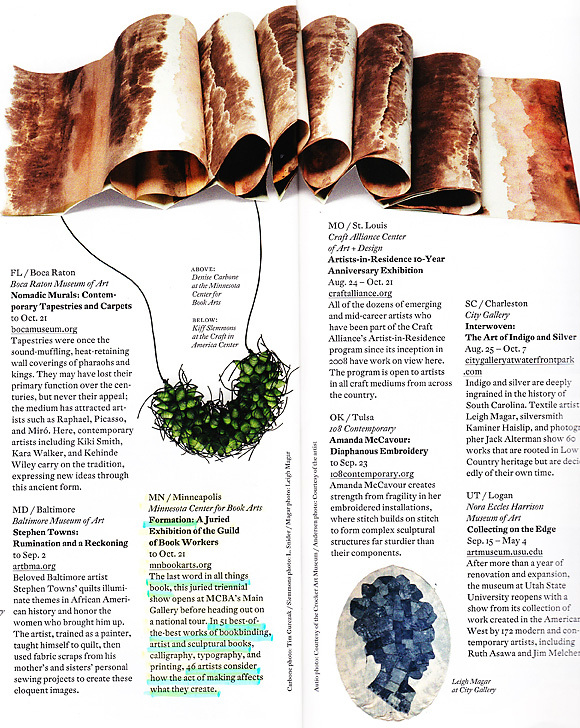 It was thrilling to see FORMATION featured in The COLOR Issue of American Craft magazine. Please join us, in FORMATION!